It has come to my attention that for most of us runners or even workout addicts out there, it is sometimes expensive to purchase most of the gadgets and gizmos that is available out there to actually track your workouts or runs. Like myself for example, not only it becomes a problem for me to track my runs because I DON'T have a super expensive and high tech gadget to do so but I still find it important to do so. Even if I can afford to buy a tracker, I still don't know which one is the best to use. Then someone introduced to me, Endomondo! Originally Ash was the one using it first before I caught on to the hype, Endomondo is a FREE system that is provided via online and your smartphone that tracks down your workouts via GPS and calculates your record and statistics while you run. The application is made free to almost all smartphones (except Nokia for some reason) and its pretty easy to navigate considering the features that they have included on the program. From what you can see, the program actually does initially a very basic interface where all you need to do is press start and start running. The program will not only allow you to play music from the playlist that is available in your phone but at the same time it has a voice trainer that will update your statistics every kilometer that you run, cycle or even swim! The first time I tried the application out was just recently in my PJ Dawn run, which was a 12km run. Throughout the run, the program updates me on every kilometer on how fast am I going, how many KM's do I have left, which was my fastest and slowest kilometer, the elevation of the trail and everything else. The best thing was because Ash was also running with Endomondo, we could compare out statistics after the run and discuss about our progression. Another feature that I love about the program is that it is very much social media friendly, which means that every single time that you are about to start your workouts and also when you are done, it automatically updates your Facebook status so that your friends could also see your progress and track how far have you run on real time updates! Endomondo itself actually runs like a social media platform which means that if you have friends that are using Endomondo as a tracker as well, you could add them into your friends list and every single time they post and update on your status, Endomondo will actually read it to you as a motivation while you are running or cycling! 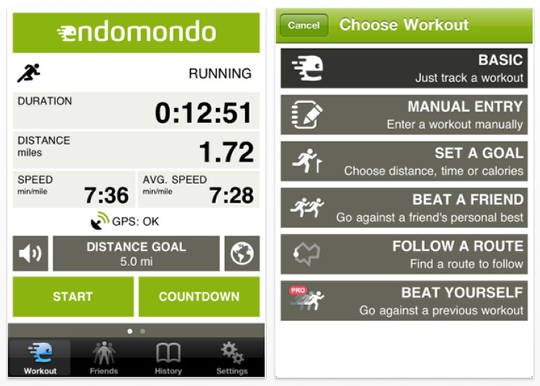 So in comparison between Endomondo and the rest of the workout application our there, how exactly does it stand? From my observation in all my previous runs, I realised that the other most popular choice is obvious. Nike+ is the one that I see a the most nowadays. Very much popular with the IPhone series, I have yet to see much statistical data in regards of the program, although I have been told that the application is pretty much awesome. The problem that I have with it is what I mentioned earlier: availability. Because the program caters specifically to IPhone users only, you are forced to own either an IPhone or an Apple or Nike product in order for you to use the program itself. For most of us who are not Apple users, we get don't get much options out of it. Endomondo however gives the option to connect with ALL phone users who are running which in my book is pretty awesome. Personally I would recommend Endomondo as a preferred choice for the obvious reason. Any thoughts on your preferrence? Do drop a comment on this! i've been using endomondo to track all my workout since June 2011, and it has help me improved on my pace and a good log for all my workout as i always like to check out the statistical part of the app(of course via their official website only). The only problem now is that they recently changed their posting to facebook to timeline interface only, thus all the users who are still using the old facebook interface won't be able to see their own workout on their own facebook..